Recovery in the retail trading industry seems to be still intact. Latest November data from CPattern covered by Finance Magnates Intelligence brings an optimistic picture of the key business metrics. What may be the reason behind it? The first positive item was the activity of retail traders. 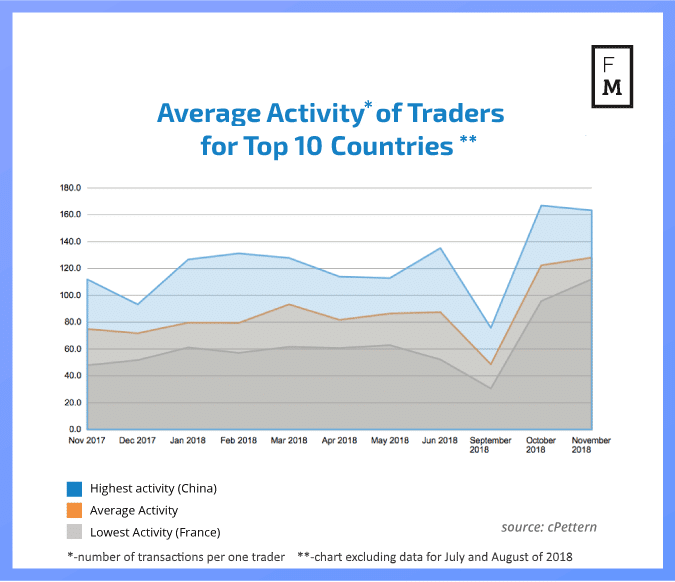 This metric tells us how often traders were conducting trades, and it is an average activity for a client in a given country. Growing activity may be of course misleading as it does not tell us anything about the size of the trades or their volume. 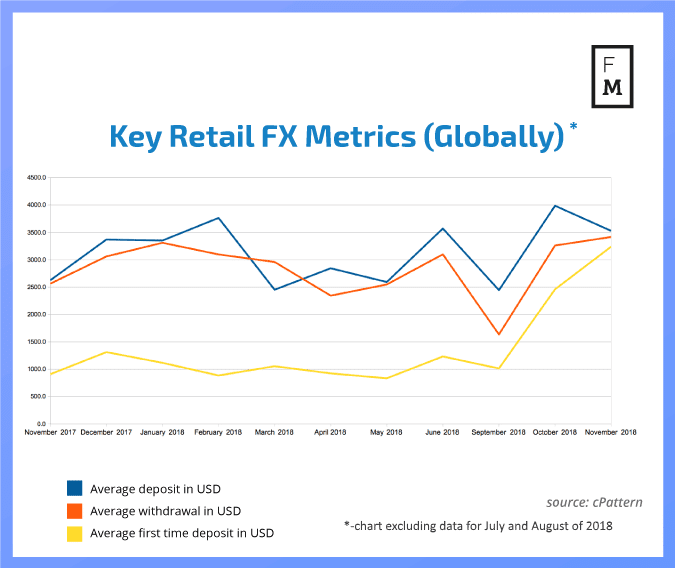 One could hypothesize that growing activity may be the result of ESMA changes since the required larger deposits force clients to trade more frequently with smaller trades. However, the most significant activity comes from China. There are also other indicators suggesting improved November situation. As can be seen in the chart above, two of the main metrics improved in November. While the value of the average deposit sent to accounts was slightly lower than in October, at $3,527.69, the average withdrawal amount grew in November, coming in at $3,415.64. The biggest improvement was seen with the average first-time deposit (FTD) which increased to $3,238.51. 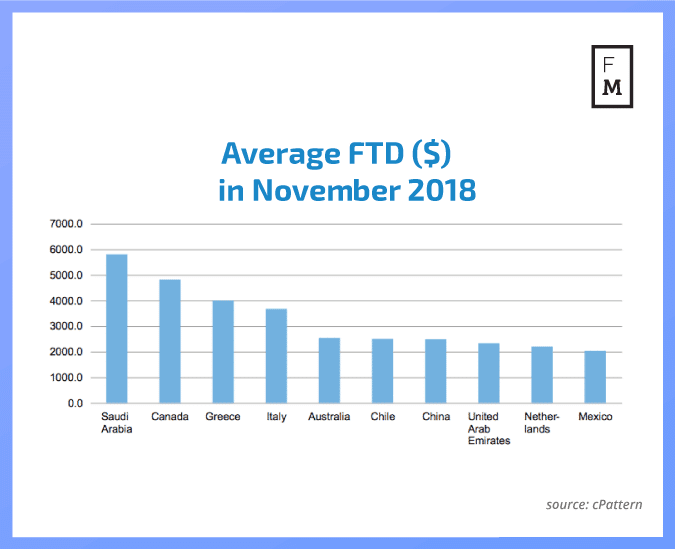 Saudi Arabia led the rankings in November when it came to first-time deposit value, with a result of $5,802.69. Canadian traders funded their accounts with just a little less than $5,000 on average. Since both countries are not EU-based, it is difficult to link their metrics with the ESMA regulations aftermath. December data, which is to be published soon, should shed more light on this issue. This is the latest publication from the FM Indices – a new cross-industry benchmark. In today’s business world, big-data analysis and access to objective information sources are crucial to success. Unfortunately, until now, it has been challenging and costly, if possible at all, to find any reliable benchmarks for operations in social, FX, binary options, and CFDs trading.